HOUSTON – When you have an itch you just can't scratch, it can be an annoying experience. But imagine how it feels for an astronaut on a spacewalk, sealed inside a bulky spacesuit. With so much gear on, even the tiniest discomfort can be an astronaut's worst nightmare. Take the case of Endeavour shuttle astronaut Andrew Feustel. On Wednesday (May 25), he was spacewalking outside the International Space Station when a bit of helmet cleaner got in his eye. The result: A stinging, teary time in space until he could find a way to ease the pain. Two other Endeavour astronauts ventured outside the space station today (May 26) on what is set to be the mission's fourth and final spacewalk. Those spacewalkers, astronauts Mike Finke and Greg Chamitoff, most likely expect at least a few aches to accompany their work. Wearing an Extravehicular Mobility Unit spacesuit, NASA astronauts Michael Fincke and Andrew Feustel (not visible), both STS-134 mission specialists, get prepared for the mission's second spacewalk onboard the International Space Station (ISS), on May 22, 2011 (Flight Day 7). Astronauts must wear protective spacesuits whenever they leave their pressurized homes like NASA's space shuttles, the International Space Station or other spacecraft. NASA astronauts, in particular, wear what the agency calls Extravehicular Mobility Units (EMUs), hefty white spacesuits with backpacks packed with oxygen and other life support necessities. So on Wednesday, when Feustel and Fincke worked on the exterior of the station for 6 hours and 54 minutes, they were hoping the only glitches would be with the tools they were using. But near the end of the outing, Feustel got some of his helmet's anti-fog solution in his eye, which caused it to water and sting. "My right eye is stinging like crazy right now. It's watering a lot," Feustel radioed Mission Control at NASA's Johnson Space Center here. "The problem with tears in space is that they don't fall off of your eye." To relieve the burning, Feustel managed to rub his eye on a foam block inside his helmet, which NASA calls a valsalva device. The device is attached to the inside of the helmet's visor, and astronauts can wedge their nose against it to help them clear their ears if needed, said STS-134 lead spacewalk director Allison Bolinger. Sneezing is another thing astronauts hope to avoid while on a spacewalk. But if an ah-choo is inevitable, there are some tricks experienced spacewalkers have up their spacesuit sleeves. Astronaut Dave Wolf, a veteran spacewalker, has said that the trick with sneezing is to have good aim, something that is actually taught to spacewalkers during training. "Aim low, off the windshield, because it can mess up your view and there's no way to clear it," Wolf said during a previous flight of Endeavour in 2009. In addition to watery eyes or plugged ears, astronauts working in the vacuum of space might also have to contend with grumbling stomachs. Spacewalks usually last between five to eight hours, and the astronauts must power through the work without any breaks for food. EMUs are equipped with a drink bag, so spacewalkers can take sips of water as they work, but they have to wait until the day's work is over before they can dig into a meal. 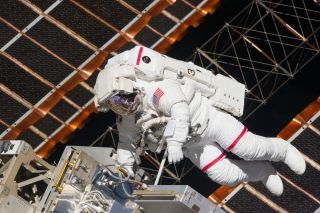 And while spacewalkers seem to just float against he backdrop of space, the work they do outside the spacecraft is much more arduous and taxing than it looks. The pressurized spacesuits give astronauts a workout when they move their bodies, particularly their upper torso, arms and hands, NASA officials said. "The main fatigue issue is hands, because you're pressurized to 4.2 pounds per square inch," Bolinger said. "Your natural suit glove wants to be outstretched, so when you bend your fingers, that can be hard work." Spaceflyers undergo extensive training to cope with muscle fatigue, and do practice runs of spacewalk procedures in NASA's Neutral Buoyancy Laboratory, which is a giant swimming pool used for spacewalk training at the Johnson Space Center in Houston. The four spacewalks of Endeavour's STS-134 mission are expected to be the final spacewalks of NASA's space shuttle program. This mission is Endeavour's final flight before being retired along with the rest of NASA's shuttle fleet later this year. NASA does have one more shuttle flight planned after Endeavour lands. But the STS-135 mission on the shuttle Atlantis has no spacewalks scheduled. Instead, it will be the International Space Station's crew that will tackle any orbital work, mission managers have said. Endeavour's crew is in the homestretch of a 16-day mission that delivered a $2 billion astrophysics experiment and other supplies to the space station. The shuttle launched May 16 and is due to return to Earth June 1.